Before you order that expensive filet, listen to our interview on “meat glue” because it’s back in the news. 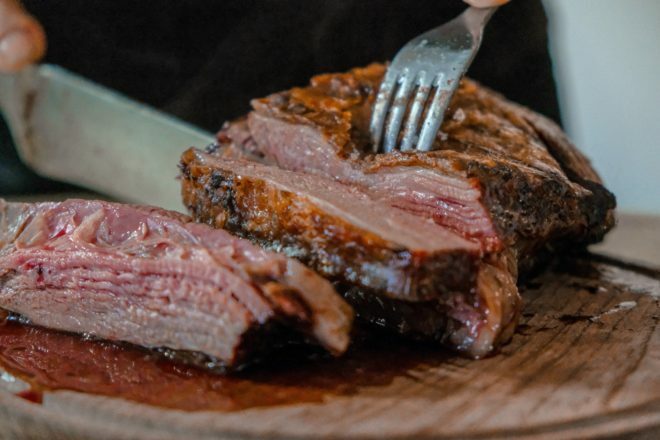 We interviewed Attorney Bill Marler a couple of years ago about “meat glue” and why there are possible safety concerns associated with consuming it. Marler is best known as the attorney in the Jack in the Box lawsuit in which children suffered from E. coli poisoning after consuming hamburgers at the restaurant chain’s locations. Transglutaminase is used to “glue” together beef, chicken, pork or fish transforming it into what appears to be one, seamless filet, steak or piece of surimi (imitation crab). It is difficult for even experts in the food industry to tell by appearance only if meat glue was used to stick protein products together. Marler says the government considers transglutaminase aka “meat glue” as a GRAS food additive. GRAS stands for “generally recognized as safe”. We explored the meaning of that term and asked important food safety questions that challenge the GRAS designation of this food additive. Find out some of the products in the food supply “meat glue” is added to and why we think there are safety concerns about its use in our broadcast interview with Attorney Marler here: Am I eating “meat glue”? Next Is Your Meal Replacement Bar Healthy?